Help Your Child Brush His/Her Teeth Until Age 10. The simple reason for this was that kids usually lack the hand-eye coordination and manual dexterity to do a good job all on their own. We all wish they could do it on their own, but for all intents and purposes, they just can’t. It’s not their fault – they just haven’t developed enough yet. And yes, I certainly found this with my own daughter, and heck, if a dentist’s own daughter has trouble…..ANYONE’S kid can have trouble alone. Automatic 2-Minute Timer: pretty much all quality electric toothbrushes have this, and it’s one of the best possible helpers, for the simple reason that most people don’t brush long enough. Given how hectic our schedules are nowadays, it’s so easy to grab the toothbrush, whip it around your mouth for 30-seconds and feel like you got everything, spit the paste out and rinse, and you’re out the door. NO NO NO NO NO! If you brush that fast, I guarantee you missed a LOT. Even after almost 15 years of using a Sonicare myself, I still find those 2 minutes seem to last forever. Same with your kids – going fast means doing a bad job. They’re More FUN: plain and simple, if you want your kids to WANT to brush their teeth, try to make it more fun. And yes, electric toothbrushes are more fun. Remember that we’re talking about kids here, not adults, and that funny feeling of the brush vibrating on the teeth and gums is cooler than a plain toothbrush where you and the child have to do all the work. Sure – get the Barbie one for girls and Superman if it helps. They Work Better: with manual toothbrushes, you really need good technique to do the best job possible. Not that you can’t do it for your child (they definitely can’t), but I’m always amazed at how poorly people brush with a regular brush. 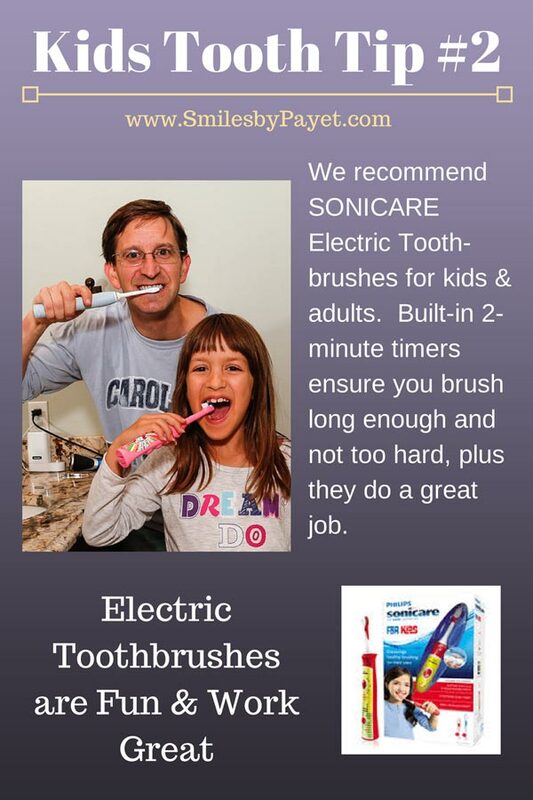 Electric toothbrushes do a lot of the work for you, which means you get a better result. 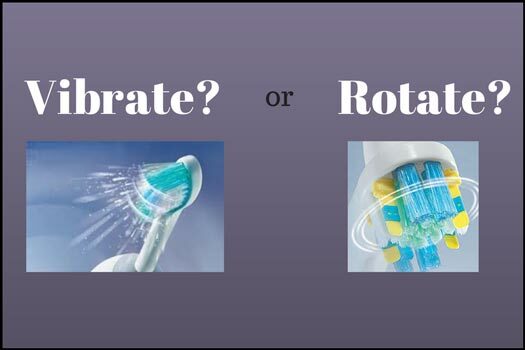 With the rotating brush heads, you have to focus on brushing each tooth individually, both front and back. Again, this requires more dexterity and attention to detail. Since I’m working on the assumption that most people are lazy when brushing their own teeth and their kids’ teeth too (c’mon – admit it! If you tell me I’m wrong, I’ll tell you you’re lying. LOL I’ve been doing this too long and know better. 🙂 ), anything that requires more work ain’t gonna happen. So with the vibrating brush heads that cover several teeth at a time, I know you’re more likely to do a better job – as long as you take your time. And the same goes for when your child is ready to take the responsibility all on their own. Need to dentist for your whole family?